NEW YORK, United States (AFP) — Descendants of a Jewish Parisian art collector are welcoming the return to their family of a rediscovered masterpiece — a 17th century painting looted by the Nazis during World War II. The brothers are the great-grandsons of famed art collector Adolphe Schloss (1842-1910), and were accompanied at the event by Eliane Demartini, another rightful heir of the looted art. French Foreign Minister Jean-Yves Le Drian was present and spoke at the event. The painting was stolen by the Nazis in 1943, during their occupation of France, and sent to Adolf Hitler’s headquarters in Munich. The painting vanished at the war’s end, and resurfaced only in November 2017 when a Chilean art dealer tried to sell it via Christie’s auction house in New York. Christie’s identified the piece and contacted the FBI to begin the process of restitution. Jean-Yves Le Drian, Minister for Europe and Foreign Affairs of France speaks before the 1639 painting by Salomon Koninck titled “A Scholar Sharpening His Quill” looted by the Nazis from the Schloss family during World War II, was unveiled April 1, 2019 at the French Consulate in New York City. 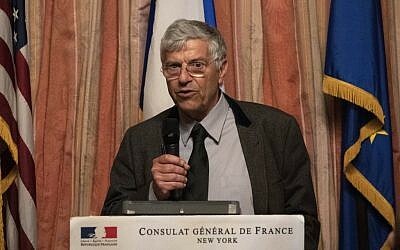 Given the reemergence of anti-Semitism in the United States and Europe, a restitution “puts the spotlight on all the looting and Jewish disappearances,” said Michel Vernay, a retired engineer. “It’s like a monument in tribute to what happened in the past,” he said. Theft and looting is an integral part of the process of genocide, said Vernay, whose mother lost half her family at the Auschwitz death camp. 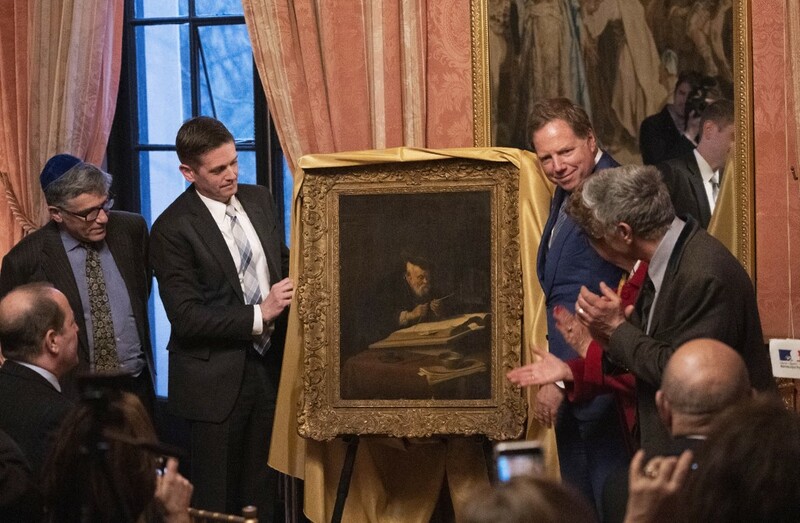 Laurent Vernay speaks after the 1639 painting by Salomon Koninck titled “A Scholar Sharpening His Quill” looted by the Nazis from the Schloss family during World War II, was unveiled April 1, 2019 at the French Consulate in New York City. Laurent Vernay described every restitution as a small victory. “But one painting is not as important as any single life that was taken,” he said. The brothers are convinced that the return of anti-Semitism is not a passing phenomenon. “It’s up and down but its always there,” Laurent said. What plans are in store for the painting? The artwork is an inheritance that is shared with more than 20 people, he said. Even though there are 170 paintings still missing out of the 333 in the Schloss collection, the brothers have no plans to search for them. 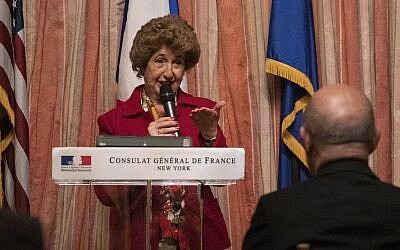 Eliane Demartini speaks directly to Jean-Yves Le Drian, Minister for Europe and Foreign Affairs of France, after the 1639 painting by Salomon Koninck titled “A Scholar Sharpening His Quill” looted by the Nazis from the Schloss family during World War II, was unveiled April 1, 2019 at the French Consulate in New York City. Both Michel Vernay and Eliane Demartini deplored the way that French museums have dragged their feet when it comes to returning Nazi-looted artwork. In the United States “there is a real procedure and a pride to be able to restore these works,” Michel said, while in France such restitutions have been done in a haphazard way. French museums, including the Louvre, limit themselves to displaying recovered artwork under the label “MNR” (for “National Museums – Recovered”) until the descendants recognize the pieces and step forward to claim them. 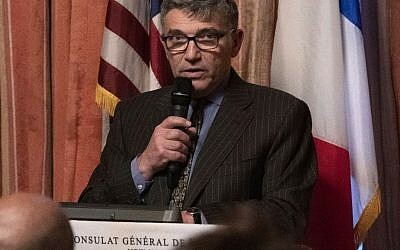 Michel Vernay speaks after the 1639 painting by Salomon Koninck titled “A Scholar Sharpening His Quill” looted by the Nazis from the Schloss family during World War II, was unveiled April 1, 2019 at the French Consulate in New York City. “For me, who is 70 years old, these works of art were looted 75 years ago — I have no memory of them,” said Michel. “To exhibit them, saying ‘find your artwork,’ for people who had not even been born or were a year or two old during the war, and who are more than 80 years old today — excuse me, that’s really a joke,” he said. 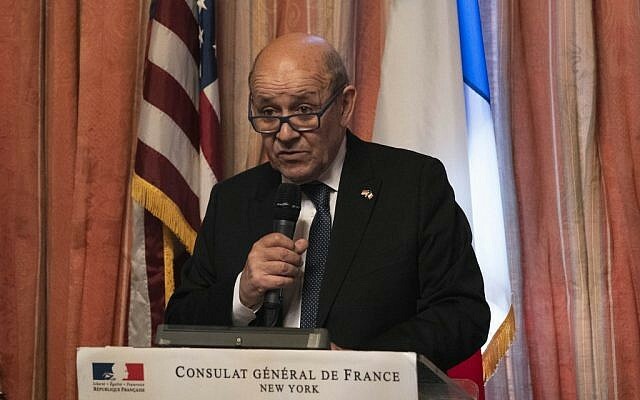 Le Drian, the foreign minister, reminded them that the French government committed themselves last year to “accelerate and intensify the work of identifying and restituting to their owners” looted works of art. “The fight that you have carried out along with your lawyers” to recover the artwork “is also our fight,” he said.